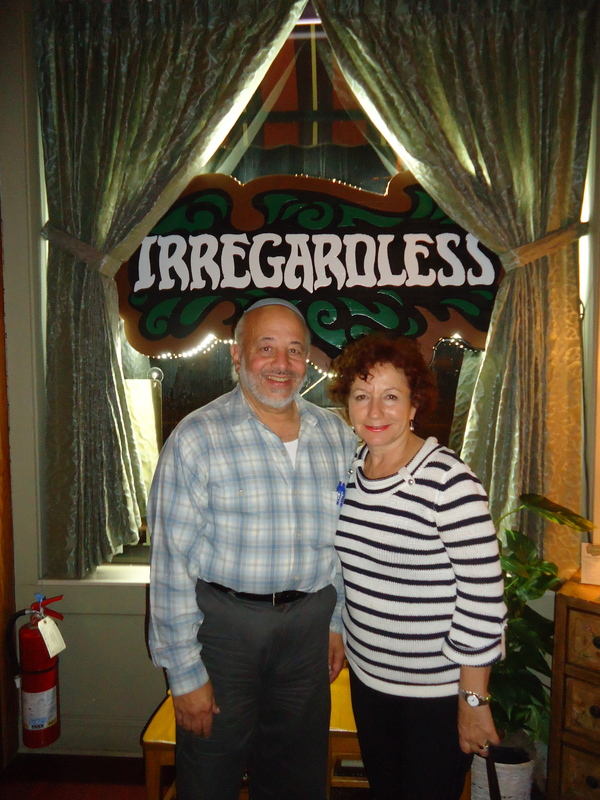 The Irregardless Café was bustling with people when I sat down to meet Arthur and Anya Gordon. These delightful owners believe in supporting their community. Kyle Highsmith, a local artist has graced the walls of The Irregardless Café for years with his unique paintings. 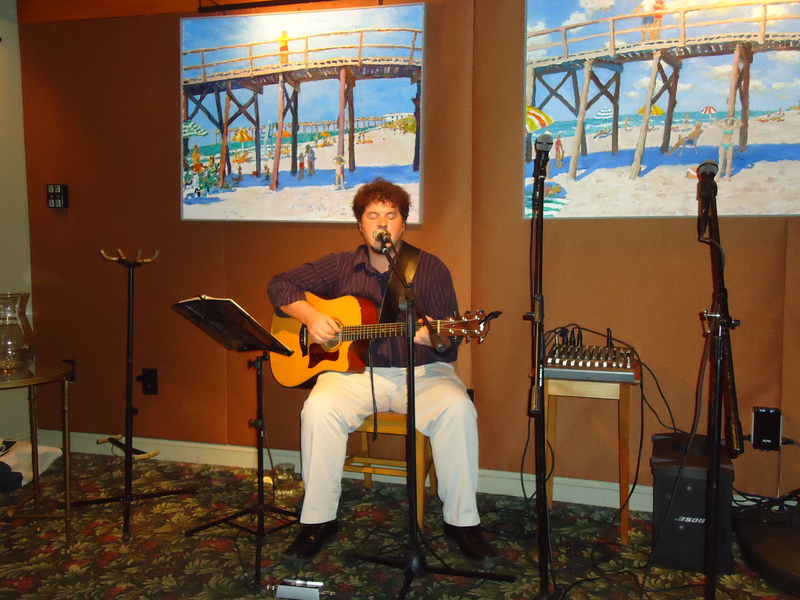 The artwork looked beautiful in the dim lighting and a local acoustic pop, Celtic and folk guitar player, Dave Condon serenaded the restaurant’s patrons. Over 37 years ago, Arthur dreamed of attending the Culinary Institute of America (CIA) after receiving degrees in both chemistry and philosophy from the University of North Carolina at Chapel Hill. To his disappointment, Arthur was turned down from the CIA for having little culinary experience. Instead he started a business and opened the first vegetarian restaurant in Raleigh on February 4, 1975. Arthur will certainly go down in the history books for The Irregardless Café being the longest running restaurant with the same owner in Greater Raleigh. I’d say he now has enough experience to attend the CIA, wouldn’t you? Arthur and Anya believe in supporting the local food movement. They have some exciting and innovative plans for the restaurant in the spring involving local foods. They aren’t new to this arena; Arthur has been purchasing produce from local farmers since the opening of The Irregardless Café. He currently uses Fresh Point as the restaurant’s produce distributor. The owners’ philosophy of supporting the community can be seen in their menu, which changes with the seasonality of fresh produce. In 1975 The Irregardless Café offered four vegetarian entrees on the menu, which were handwritten on a blackboard. Arthur changed the menu after consulting his dishwasher each evening about which foods were coming back barely eaten. Even though he aimed to please customers, Arthur noticed the restaurant was extremely busy during the week but was losing business on the weekends. Being a businessman, he did not want to exclude or limit his diners. Thus, he added a new protein to the menu every seven years, which includes fish, chicken and beef. Being of the Jewish faith he will not put pork on the menu. The Irregardless Café is not only known for their wonderful vegetarian options, but they are sensitive to all dietary needs. The menu clearly denotes vegan, gluten-free and vegetarian options and the servers are knowledgeable if you have any questions. Each meal begins with a basket of freshly baked gluten-free corn muffins and vegan bread. The flour is locally sourced from Lindley Mills in Graham, North Carolina. The Irregardless Café has been baking bread in-house for over 37 years. I challenged myself to eat a vegan meal during my visit at The Irregardless Café. 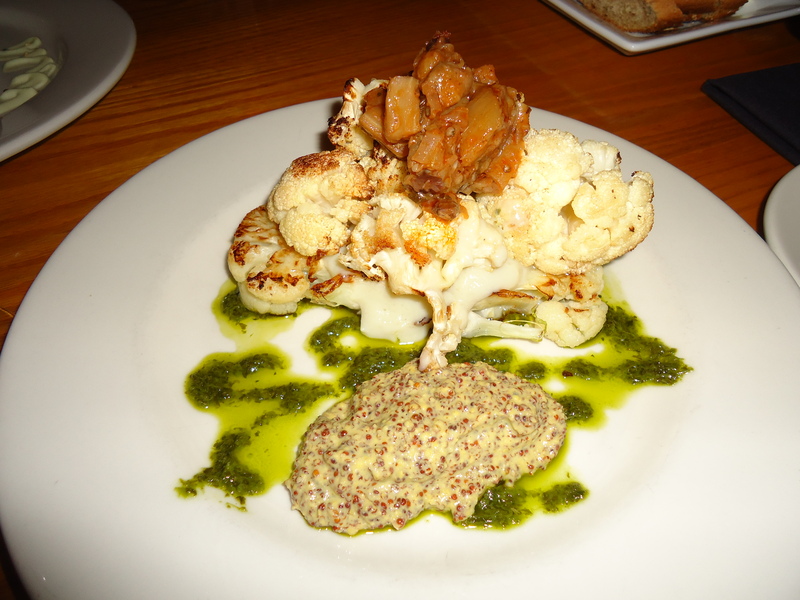 Anya and Arthur started out the meal by ordering the cauliflower trio small plate. The dish includes layers of caramelized, roasted and mashed cauliflower, which is then topped with an eggplant caponata and basil puree. This vegan and gluten-free dish was flavorful and creative. I definitely wouldn’t have thought of it! 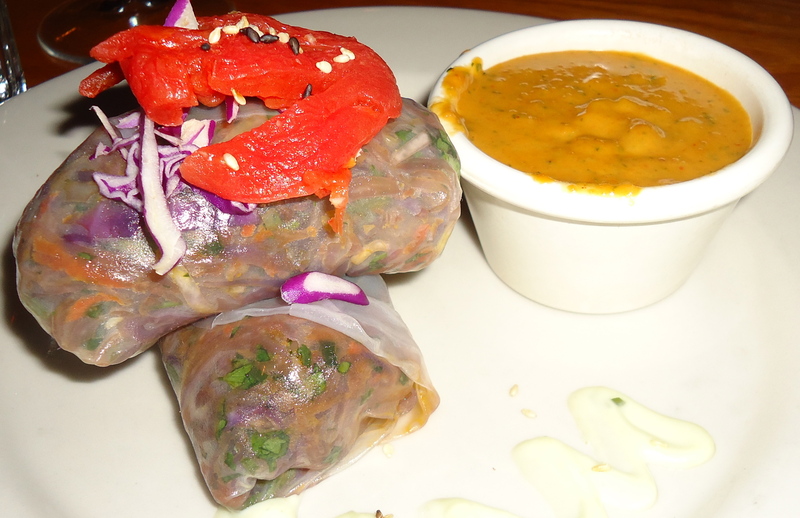 We also ordered the Vietnamese rice paper spring rolls for an appetizer, which includes sautéed fresh seasonal vegetables wrapped in rice paper. The dish was packed with flavor and the spicy Asian peanut sauce added a sweet kick. 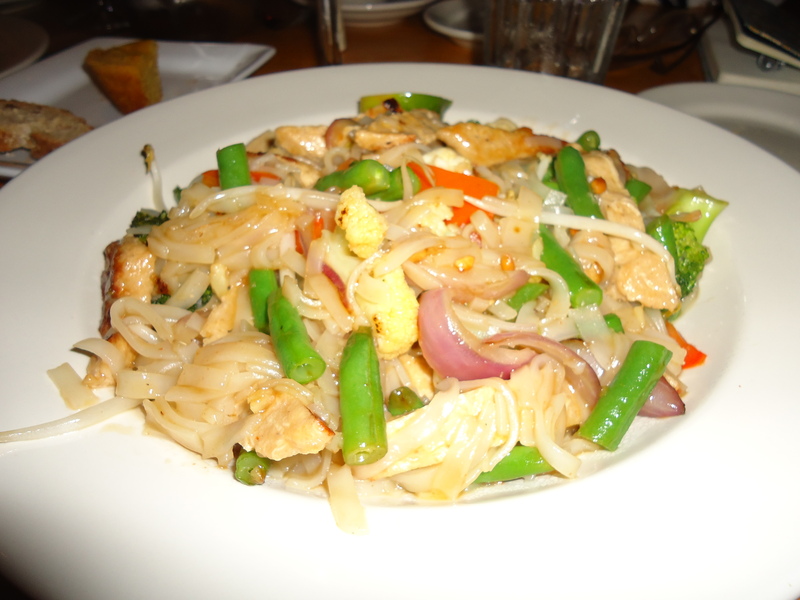 Anya’s favorite vegan entrée is the Pad Thai noodles. Indonesian inspired rice noodle pasta is tossed with tofu seitan strips and vegetables in a tamarind, coconut milk broth with toasted peanuts. This large dish definitely satisfied my appetite and I even had leftovers for lunch the next day. The Irregardless Café has plenty of options for vegans, vegetarians and those patrons with dietary needs. The vegan and gluten-free eggplant moussaka is a dish I will be trying during my next visit. Sliced eggplant is marinated in lemon tahini dressing, dredged in nutritional yeast and roasted. 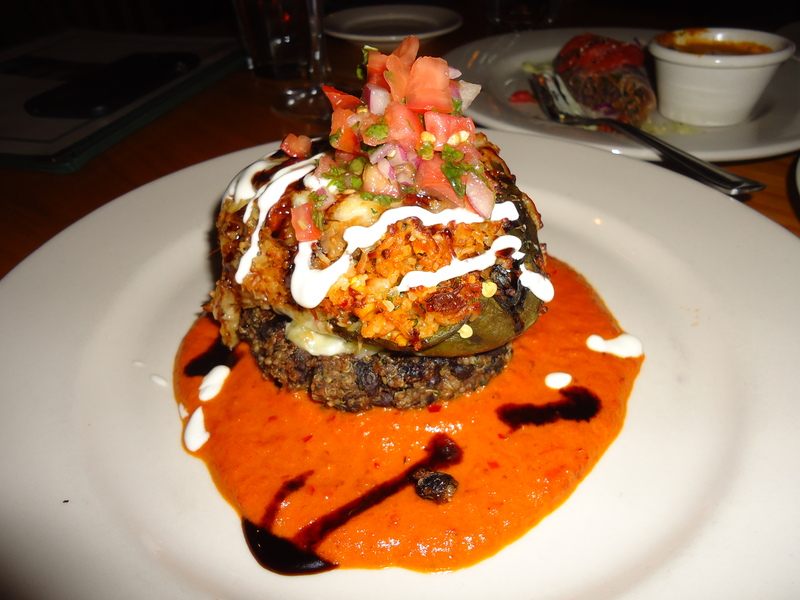 The eggplant is then layered with oven roasted sliced Yukon gold and NC sweet potatoes and marinara sauce. The stack is finally topped with a cashew nut tofu “ricotta” cap. The dishes are creative, beautifully plated and delicious. You can’t forget dessert! 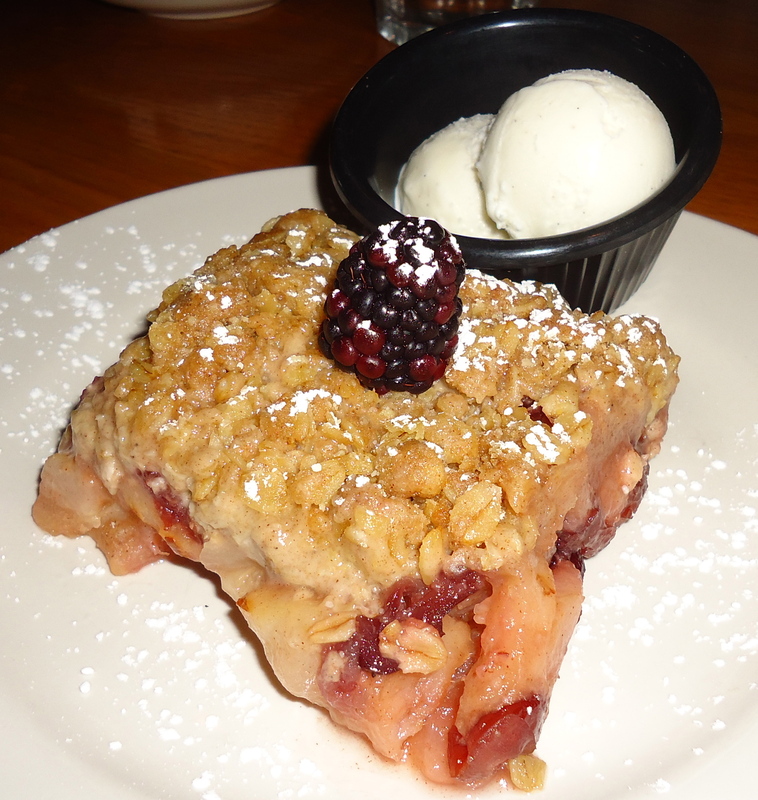 We ordered the cranberry and pear crisp as our vegan dessert. I was stuffed after dinner but had to try a bite of this sweet treat. You are also able to order the dessert with ice cream. Not only can you enjoy an excellent meal at The Irregardless Café, but they also cater and have special events at the restaurant. The last Tuesday of each month the restaurant hosts Being Well, which include topics like sustainability, nutrition and health. The next Being Well series is focused on the spirituality of eating with Duke Professor Norman Wirzba. On Tuesday, December 4, 2012, 7-8pm he will lead a discussion about how eating is a moral and spiritual act. Anya and Arthur made me feel at home at The Irregardless Café. I felt so inspired after talking and laughing over a delicious vegan meal and bottle of wine. Anya and Arthur have built a community at their restaurant. The couple’s philosophy is that food feeds your soul, and they are definitely bringing this to life at The Irregardless Café.